Like people, cats need to watch their diet and exercise to stay healthy. 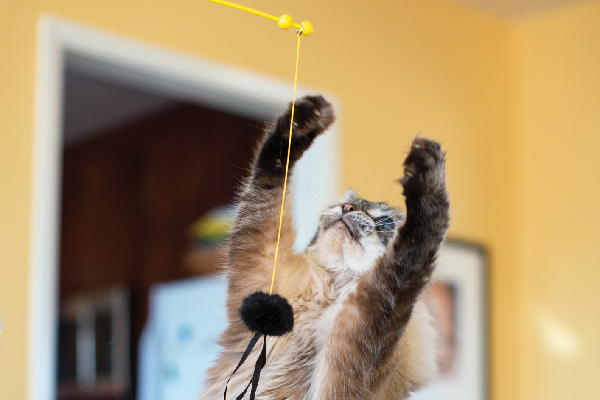 Since it’s unlikely cats will decide to jog around a block or lift weights, you need to find other ways to get your cat moving and that involves playing off a cat’s instincts. Think of games that let your cat hunt and move. The idea is to keep your cat active and let it stalk and attack light beams shining on the floor or toys that they can attack on the ground. Keep your cat moving and keep yourself moving too. If your cat is getting in shape, you might as well move too. To learn more about how to exercise a cat, click here.